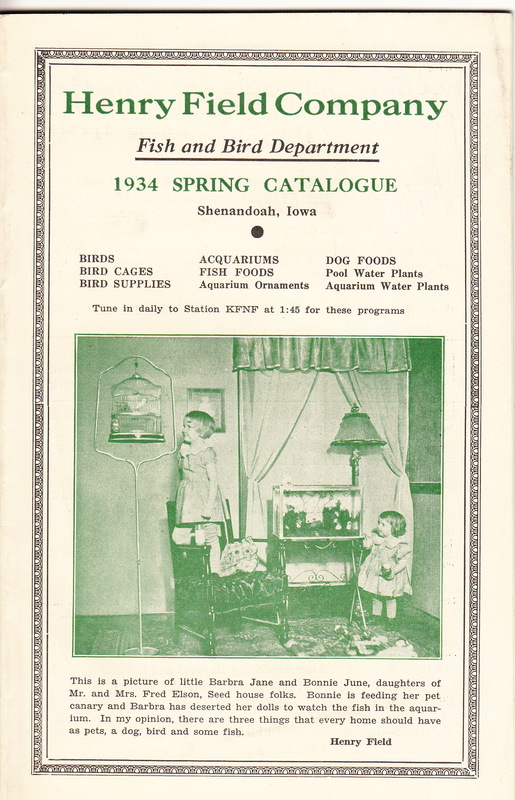 In 1934, the Henry Field Company of Shenandoah, Iowa, published two spring catalogs. One was its seed and plant catalog, representing the largest and oldest part of the business. However, the company’s “Fish and Bird Department” got its own catalog. The cover photo showed Barbra Jane and Bonnie June Elson, daughters of two Field employees, enjoying their pet canary and a tank of fish. “In my opinion,” wrote Mr. Field, “there are three things every home should have as pets, a dog, bird and some fish.” Cats were left out of this equation; since Mr. Field was an old farmer, it’s likely that he still regarded cats as workers rather than companions. 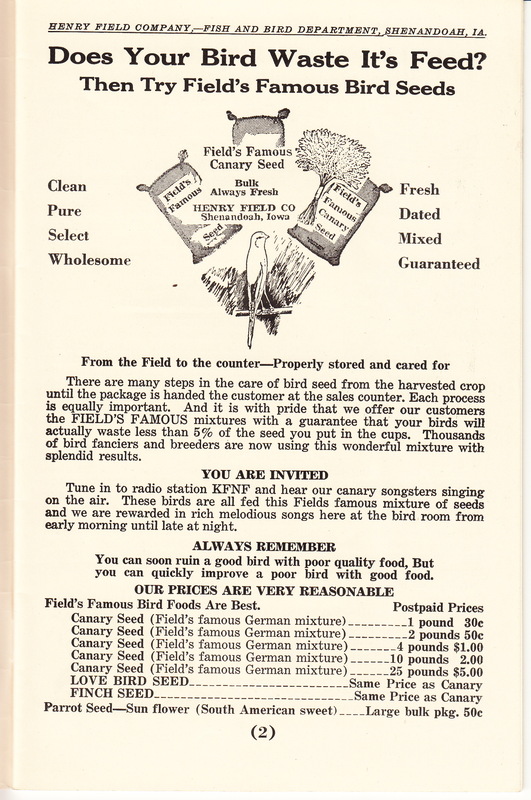 The Field Company also shipped canaries by express to their rural customers, offering a fine selection of imported birds and their own trained “Crooners.” You may not know that all birds, wild and tame, have to learn their songs, and canary breeders, especially German and English fanciers, used both “bird organs” and older birds that were exemplary singers to get the songs they wanted. 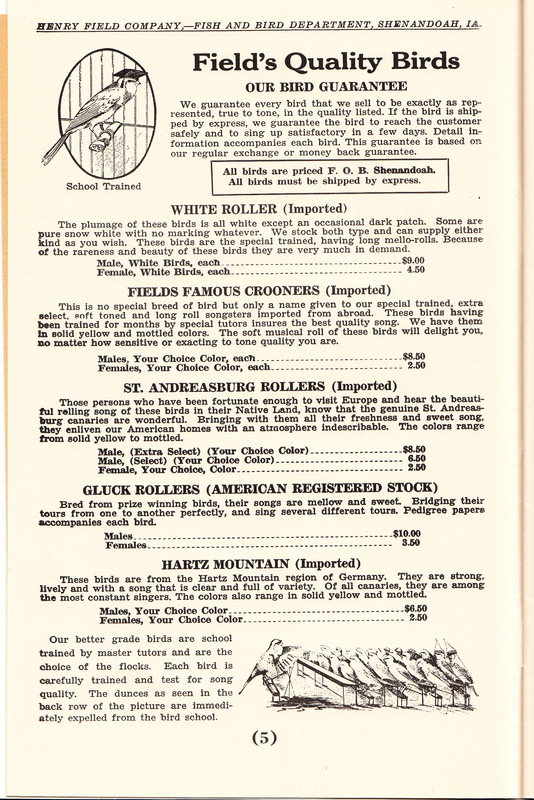 Probably the most famous singers were Andreasburg Rollers, originally from Germany, and Field offered these, too. But what I like about the “Crooners” is that the name invokes the mellow singing style of Bing Crosby and others of his ilk. 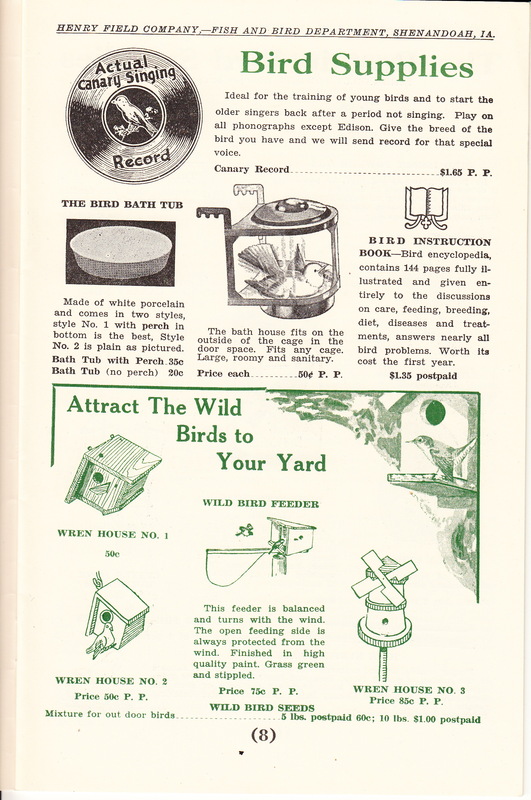 Like any pet store, the company also sold special supplies, including a recording of singing canaries to help keep your own bird in good voice and several lovely bird bathtubs. Note also the bird houses and a feeder for attracting wild birds to the back yard. This hobby really took off in the 1920s, and I’ll write more about it another time. Finally, the Henry Field Company also offered set-ups — containers, plants, and ornaments — for old-fashioned balanced aquaria, which I wrote about in previous post. Goldfish, turtles and salamanders were a separate expense. Thus the Henry Field Company provided two of the “three things that every home should have as pets.” Customers had to come up with their own dogs. The mail order pet business made use of this country’s extensive rail system, which reached very small communities, to ship uncounted numbers of fragile creatures by express to eager pet owners. The advent of Rural Free Delivery in 1895 also played a role, especially for the distribution of supplies and equipment. I’ve collected a number of catalogs from these mail order businesses, and their heyday appears to have been the 1920s and 1930s. Very few of them were also seed businesses, however. In this, Henry Field Company was in tune with the role that florists played as sellers of songbirds and goldfish in the first half of the nineteenth century. Previous Meet Wrinkles Vaughn — Happy National Dogs Day!